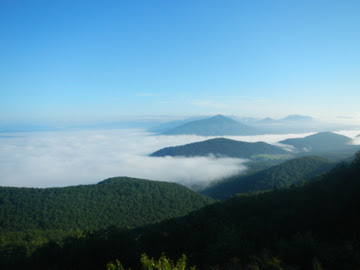 The view from the Purgatory Mountain Overlook on the BRP. The first two sections were nothing to write about, as they were within sight of the Blue Ridge Parkway and really not very interesting. (The view from the BRP itself, though, was spectacular! At least until the heat burned off the low level clouds.) I was expecting to be similarly underwhelmed with the day's third section, but was very pleasantly surprised. The view from the Foot Bridge of a rain-swollen James River. The section of the Appalachian Trail just north of the James River is relatively new. Back in 2000, the A.T. moved its James River crossing from a somewhat nerve-wracking route along the side of the U.S. 501 bridge to a special pedestrian bridge specifically for the Appalachian Trail. Named the "James River Foot Bridge" after thru-hiker Bill Foot, who negotiated rights over a long period of time. It was constructed on piers from an 1881 railroad bridge. The bridge and its parking lot have proven very popular with locals - so popular that the U.S. Forest Service, which oversees the bridge, has had to implement restrictions on partying and swimming in the area. Link. When the Foot Bridge was opened, the A.T. was rerouted to meet U.S. 501 at the bridge. Because much of my A.T. hiking in this area dates to before the bridge was completed, I needed to come back here and hike the reroute so I could say I had hiked a continuous section of the A.T. This was my last section, completing a continuous section of about 250 miles. As I stated, I expected to be underwhelmed, because this section was designed to link two existing parts of the trail. But I could not have been more wrong. This is one of the more delightful sections of trail that I have seen in Virginia. 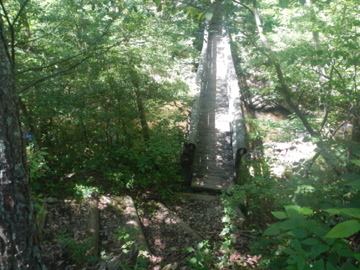 First bridge, looking from the northern end of the trail. 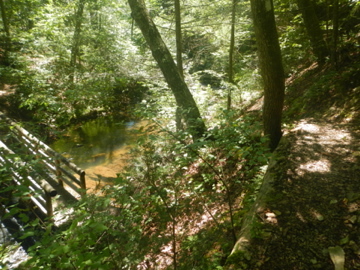 The trail starts by crossing Rocky Row Creek on a nicely constructed wood bridge. It then hugs the side of a slope, held there by expert construction of log barriers. Because of the steepness of the ravine, the noise of U.S. 501 becomes nearly imperceptible almost immediately. 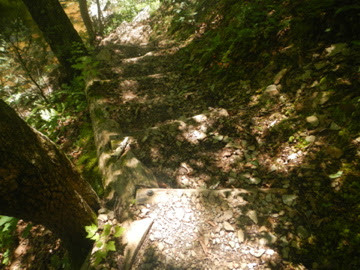 The trail then crosses the stream again, and climbs the ravine on a series of steps that show great craftsmanship in their construction. Another shot of the first bridge. 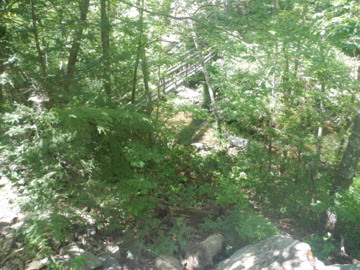 The trail drops quickly to the second bridge. Check out the construction of these steps. After a little over a mile, the trail climbs out of the ravine to cross the Hercules Road. It was at this point that I turned around, as I had previously completed the A.T. north of this road. The Trail here heads north past the Johns Hollow Shelter (where I spent part of a migraine-shortened November night back around 1994), and up to spectacular views from Fullers Rocks. 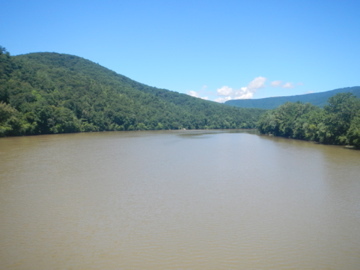 According to the current Appalachian Trail Guide for Central Virginia, the trail that parallels the creek "was part of the original 1930 A.T. [alignment]." The bridges were built in 1999 by the Forest Service, Konnarock Trail Crew (an A.T. trail crew that takes on big projects throughout Virginia), and volunteers from the Natural Bridge Appalachian Trail Club. It was a job well done.